The #1 most recommended book on Amazon.com for consultants interested in building a practice. Written for clients, this book is indispensable for consultants. Replace the typical consultant’s mindset of emphasizing expertise and differentiated processes with a focus on building relationships, engendering trust, and solving clients’ existing problems. In The Irresistible Consultant’s Guide to Winning Clients you’ll learn a step-by-step approach to winning more projects from more clients at higher fees. From nuts-and-bolts business advice and tactics to a deeply insightful breakdown of the human side of a very human profession, this is a comprehensive guidebook that is at once highly approachable and satisfyingly detailed. If I could have just one book on client strategy, this book would be it. I can't recommend it highly enough. Fields' delightful book isn’t just about winning clients--it’s about winning them the right way, for the right reasons, in ways that add to everyone’s wealth. Fields delivers a comprehensive guidebook that is at once highly approachable and satisfyingly detailed. A great framework for success for those of us who must acquire clients and maintain relationships. David’s writing style is fun and engaging, but the amount of content packed in is tremendous. Great value! I am part of a group of experienced consultants and we learned a ton from David’s latest book. The section on the context document is worth the price of the book by itself. You will become a better consultant by reading this book which will not only benefit you but more importantly your clients. THE BEST book I have found for those considering or already participating in the world of Independent Consulting. Really changed the way I think about how I approach business development, working with prospects and how to build a great consulting business. This Book will Make a Difference to You! Great book, full of real sharp activities, choices, steps to make even for experienced consultants. David is also a master in getting to the point using small amounts of text. As time is money – particularly prior to reading the book- this fits the consulting-audience purposes quite well. After implementing and bringing the advice to results I will most definitely come back on the results I have achieved. Fun to Implement and Easy to Understand! I don’t write reviews very often. But I do have to say this book has had a major influence on my thoughts about selling. The whole book is useful, but what I especially loved were the sections on proposing and closing a deal. Fields presents very-easy to understand steps that I was able to turn into a meeting agenda, proposal format and steps to closing a deal. I was able to go from reading the book to closing my first deal with this methodology in just a few weeks. I obviously have years of selling experience so I already had context, but this material is priceless. Not only is David’s book funny, engaging, and filled with amusing little stick-figure drawings, the content is super valuable and spot on. If you do the things he suggests in the book, you will be a more successful consultant. And, more importantly, you will have more fun doing it because your work will be creating value and it will be aligned with your best self. David nailed it. Having been in leadership roles with Big 4 consulting firms for 20 years, the insights and tidbits David shares in the book provide the framework for identifying and serving clients — successfully. The #1 key to being successful in consulting is having the ability to put yourself in the seat of the client executive — David calls it “right-side up thinking”. As a bonus, the book is motivational, humorous, easy to read, and a confidence builder. The One Guide any Consultant Needs to Own. You Won't Regret this Purchase. This book has become my most important guide for growing my business. It is a treasure trove of step-by-step processes for consultants. David covers in detail how to build visibility through speaking, social media, trade shows and writing. If you are a consultant or think you might want to become one, I don’t think you can afford NOT to carry this book in your briefcase. The value I’ve gotten has far exceeded most other books on my shelf. Written for clients, but indispensable for consultants, The Executive’s Guide to Consultants will arm you to succeed where others stumble and fail. Irrefutable arguments for why and when to use small consultancies like yours rather than big, brand name mega-firms. Pricing structures appropriate for ongoing advisory engagements as well as for shorter term project work. Tools and templates to set your projects up for success from day 1… and through to the final deliverable. A careful, thoughtful, thorough approach to every aspect of the consulting project, alerting you to issues that you might be overlooked but can cause problems. An extraordinary book. Clear, comprehensive, and eminently readable, it is THE book on how you can extract true business value from outside experts. A powerful antidote to the strained relationship between consultants and clients. As a fairly new, independent consultant (<2 years in business), I found this book to be a master class in understanding the world of consulting. David is truly an expert in the field, and understands the business like no one else I’ve encountered. This book provides descriptions, real world examples and scenarios for every aspect of consulting. From how to structure a deal, determining project value and ROI, and figuring out if you should self-perform or outsource a project, David walks you through the process and explains each detail or variable completely. I highly recommend this book for everyone involved with the consulting world, either as a consultant or as someone hiring a consulting firm to work with their company. This guide is so thorough it is a solid reference; not only for executives, but consultants as well. It clearly shows why and how using outside consultants can benefit organizations. It can also be used as a guide for specific internal projects, including cross-functional teams. There is great detail – thus one can delve as deeply or as lightly to fit interest / needs. The book also serves as a springboard for discussion at any given point in a project. As the CFO of a consulting company, I have used this book to reduce risk when hiring consultants for my company as well as to bring in more & larger projects for my team to fulfill. Don’t miss the sections on risk reallocation / contract tuning keys and how to determine the value of a project. What I like best about The Executive’s Guide to Consultants is just enough conceptual grounding to provide useful context and the quick move to concrete examples and specific language. Best of all, I was able to read this 20 minutes at a time whenever I could grab the time for it. It doesn’t require one huge block of time in order to reduce risk and make money using it. 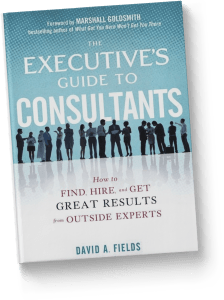 David’s book, while written to guide executives hiring consultants, is a valuable guide for those starting or growing a consulting practice. I particularly value his framework for a context statement since it not only helps define the scope of a project – it provides insights on opportunities and methods to add value to a project and with doing so generate more revenue for the practice. Well written, the book is also easy to read. Get the book and google David for access to further valuable learning. 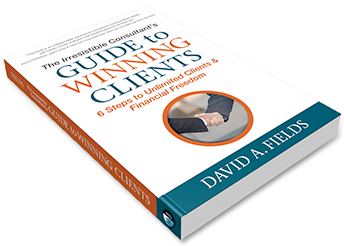 David Fields’ new book is phenomenal – he provides a step-by-step guide to the entire process, including the decision about whether you even need a consultant in the first place. He carefully outlines every factor to consider in a way that is somehow both easy-to-understand and comprehensive. He is clearly an industry veteran with significant experience, but he doesn’t allow that to trap him in an “old world” mindset. He not only points out what isn’t working, he offers dynamic solutions and unique insights into solving the problems that are often present in this industry. “Executive’s Guide…” is full of exceptional wisdom and systems and processes that all but ensure a desired outcome if followed correctly. Bottom line: this is an absolute must-read for anyone considering hiring a consultant and for anyone who is a consultant. David A. Fields has written the definitive “user’s guide to consultants” and at the same time, a terrific rule book for high-integrity consultants to play by. As an independent consultant myself for over a decade, and having worked inside large professional services firms like Towers Perrin and the global consulting division of Oracle/Peoplesoft, I can tell you firsthand that David Fields knows the game – the good, the bad and the ugly. The best part of this great book? Hard to say – it could be David’s sharp insights. It could be his sense of good humor. It could be the surprisingly collaborative, non-adversarial and balanced view of the consulting relationship that permeates every idea, every strategy and every page of this comprehensive book. If you’re a mid- to senior-level executive responsible for producing results inside your organization, sooner or later you’re going to hire a consultant. Don’t screw it up. Buy this book and implement the ideas you’ll find in it. If you’re a consultant or professional service provider of any kind – sooner or later you’re going to come across a smart client who has read David’s book. You’ll want to do your best work for them AND make a nice pile of money, too. Don’t screw it up. Buy this book and implement the ideas you’ll find in it. In his new book, “The Executive’s Guide to Consultants,” David Fields has captured the essence of a successful partnership. Having worked for a large consulting firm for more than six years, I saw the drawbacks of some of the client projects we worked on. There were no clear deliverables and the focus was on “chargeable hours,” not always value for the client. David has provided practical advice on not only how to get the most out of relationships with external consultants, but also some guidelines about when to use them and how to structure the project for success. If you want maximize the value of your relationships with external consultants, this is a must read! Given the time, money and risk of hiring an outside consultant (even those with a solid reputation … even those you’ve worked with before! ), you’d be crazy not to read this book. The author teaches you how to avoid the many pitfalls that can, and often do, sabotage your initiative. Fields explains how to smartly define the assignment, what to watch out for, how to execute, and so on. Interestingly, one can see that this book can benefit both clients and consultants. In fact, I’m going to insist to any future consultants with whom I work to read the book so we’re both on the same page. Bottom line: this book will improve your chances of getting the most out of any initiative. It certainly is helping me.